Filter monitoring is an important part of maintaining an HVAC system. Air filters are used in HVAC systems to capture and prevent particles from entering the conditioned air stream. Air filters are available in a wide range of configurations and sizes, and can be found in a variety of locations depending on application. Mechanical equipment rooms, workshops and warehouses typically have a pre-filter located at the input of the air handler prior to the junction of the outdoor and return air ducts. A secondary filter may also be found after the fan but prior to the main trunk of the HVAC system. The main purpose of this filtration system is to remove larger particles and to protect the heating and cooling coils from dirt build-up. Laboratories, cleanrooms, hospitals, pharmaceutical R & D areas and similar facilities may have two different types of pre-filters at the air handler input, and also at the final filter stage after the air handler. Applications requiring contaminant-free air such as pharmaceutical labs, biological research labs, hospital operating and intensive care rooms, isolation areas and some high tech assembly areas require the use of HEPA (High Efficiency Particulate Arresting) filters. These filters trap 99.97% of all particles. The HEPA filter is composed of randomly positioned micro glass fibers woven into a thick bed of material that may be several inches thick. There is no direct or straight line of flow through the filter, but a random, twisted path that forces multiple particle impacts with fibers, greatly increasing the chance of being captured. During use, a filter will become loaded with particles. A filter will become more and more effective as this loading takes place, up until a certain point. Once this certain point is reached the filter can start to impede air flow and increase demand on the air moving equipment. This can damage and shorten the life of equipment. Optimizing filter usage means careful monitoring of the filter’s performance. A cost effective way to do this is by measuring the pressure drop across the filter. 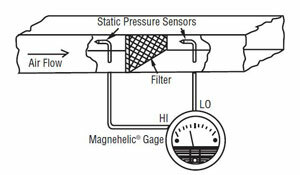 By selecting an appropriate range of Dwyer Magnehlelic differential pressure gauge (maximum permissible pressure drop across filter should be included in datasheet for filter), we can monitor this pressure. 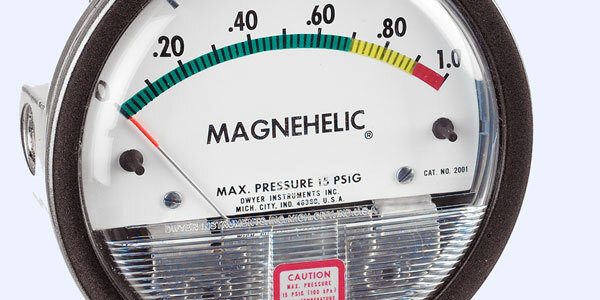 With the High and Low sides of the Magnehelic differential pressure gauge connected via static pressure ports either side of the filter, and with red/green zoning applied to the dial face to indicate maximum allowable pressure drop , engineers can see at a glance if the filter is performing as it should. This simple, but effective means of filter monitoring helps protect the air handling equipment and also helps protect the health of occupants in the building by making sure the filters are working effectively and are changed as and when required. Fluidic Ltd are the official Scottish distributor for Dwyer Instruments. We also stock all of the associated items required for installation such as tubing and static pressure ports. Fluidic also offer a dial zoning service as well as calibration. If you need assistance please contact michael.campbell@fluidic-ltd.co.uk or on 0141 641 5920.